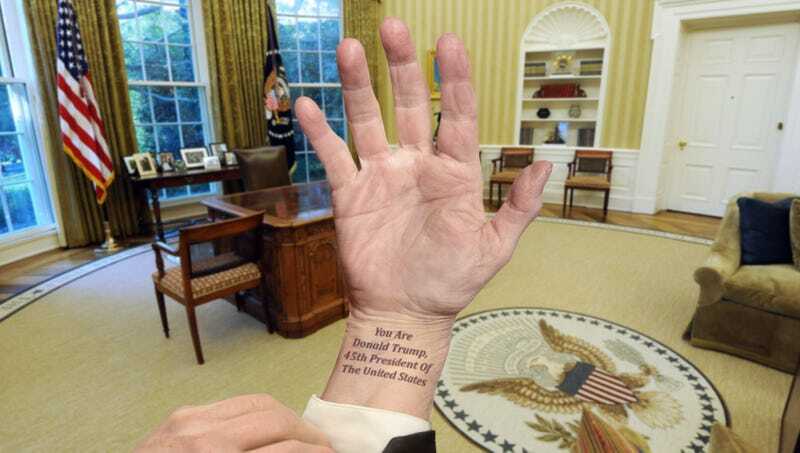 WASHINGTON—Waking in the same bleary-eyed state of confusion as he has every day of his Presidency, Donald Trump blinked at his unfamiliar surroundings and slowly shook his head several times before finding and reading the phrase, “You are Donald Trump, 45th president of the United States,” from a faded tattoo on his wrist this morning, White House sources confirmed. “You are commander in chief of the armed forces, you are a Republican, and your current wife’s name is Melania,” said a bleary, shirtless Trump, standing in front of a mirror and reading those words, as well as “Remember: Argue for immigration shutdown” and “Attack biased media,” from his completely ink-covered chest. “Rules for press conferences: evade criticisms by mentioning Hillary Clinton; smear protesters; Russia probe is witch hunt. Stephen M. and John K. are friends. All others may be dismissed/thrown under bus as necessary.” At press time, a glimmer of recognition could be seen in Trump’s eyes as he viewed a VHS tape he found on his dresser labeled “Good morning, Donald: Watch this,” which carefully detailed the 2016 election numbers and inauguration crowd size.